How would you plan for climate change? If you have the chance, attend one of the Climate Action Plan public meetings that are happening across Oahu. Sponsored by the City and County of Honolulu’s Office of Climate Change, Sustainability, and Resiliency, the community events focus on the impact of climate change and how we can become more resilient. Hawaii will always face disasters. The neighborhoods that bounce back from disasters are the neighborhoods that know each other, chief resiliency officer Josh Stanbro said. It starts with us. Most of the meeting is spent playing the Emissions Reduction Game. The game is a way for community members to think about how we should build a clean economy. It asks us to think about the long-term – what needs to happen in 2025 and 2035 to reach our goal of 100% renewable energy by 2045. Where should Honolulu focus its resources? And just as important, what can we do to reduce our carbon footprint in Hawaii? We gathered around tables set up with large “game boards” and placed strategy tiles on the board. For each of the target years, we had a limited number of projects that we could choose. The projects are all pre-selected, in five sectors: electricity, on-site energy, on-road, marine/off-road/waste, and aviation. The projects include Walk/Bike/Transit, Renewable Fuels, Building Energy Efficiency, Solar Farms, and Carbon Offsets. They are achievable and can successfully lower emissions. The game encourages us to think strategically – the big picture, not the details. But it doesn’t take into account the City’s finances. So we didn’t consider project costs, either in direct costs (fees and taxes) or opportunity costs (projects that may not be funded). We were supposed to think of our end goals, but I found myself wondering if we can afford to reach our goal by 2045. 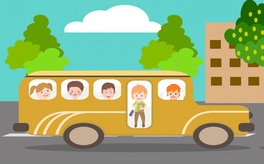 Are there cost-savings or crucial health and safety benefits from moving aggressively? Could a slightly longer time frame save us money and allow for new technologies to be tested that could help us reach our goal, making up for the time delay? I have to believe that the Resilience Office considered this, and felt that the 2045 target date is the most effective, efficient, and affordable choice. One draw-back is that the projects were all pre-determined. There were no “write-in” tiles. 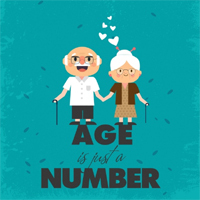 We couldn’t suggest our own strategies or “jump ahead” to strategies that are only available in later years. For example, one strategy that was missing is limiting the number of people who can live in or visit Hawaii. This goes against the aloha spirit, could spell economic disaster, and may even be unconstitutional. But just as there are occupancy limits set by the Fire Code and a maximum capacity at Disneyland, limiting the number of people is an option. In the end, what really struck me was realizing that we have the power to influence government. We can help government set priorities and policies, instead of waiting for government to tell us what to do. Whether it’s at a community meeting, public hearing, or our polling place, we just have to show up. 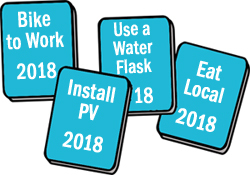 For more information about public meetings, community events, and resources, including a meeting about the City’s Multi-Hazard Pre-Disaster Mitigation Plan on November 3, 2018, visit Resilient Oahu at http://www.resilientoahu.org. Make a Difference Day continues to engage communities through Points of Light, an organization dedicated to volunteer service. On October 27, 2018, thousands of people will make a choice to give back to their local community – in Hawaii and around the world. There are so many ways we can make a difference – through donations, time, expertise, or kindness. Volunteer to help cleanup in Chinatown in Honolulu (with American Savings Bank and Kupu Hawaii), in community cleanups at Pearl Harbor Bike Path in Aiea, Lehua Avenue in Pearl City (with PCP CPO A and Nimitz Lions Club), Waipahu Depot Street in Waipahu (with Lighthouse Outreach Center), Aiea Kai Way in Aiea (with ATG MidPac), Aiea Bay State Recreation Area in Aiea (with USS CHAFFE), Neal S. Blaisdell Park and Puuloa Springs in Aiea (with The Mission Continues), Pupuole Mini Park in Waipahu (with Inspire Church and Waipahu Community Coalition), Pūpūkea-Paumalū State Park Reserve in Haleiwa, and Waimea Valley in Waimea. UH Hilo students can work on various projects for a campus and community service day in Hilo. Volunteer to help community cleanups at Banyan Street in Kalihi (with OceanTroller) and Palolo Stream in Palolo (with Trees to Seas). I just learned about a Clean Swell app that lets you track the opala you collect or start your own clean up at a beach near you. I’ve been reading a little about forgiveness, I’ve learned that forgiveness does not mean condoning their actions or absolving them of guilt. Forgiveness is about you – about accepting that the transgression happened, reducing your need for punishment, and trying to feel compassion for the offender’s suffering. How will you make a difference in Hawaii and in your life? Buddhist scholar and teacher Patricia Lee Masters traveled half-way around the world, from Honolulu and Ceylon to India and Chicago, to find Mary Foster, granddaughter of a Native Hawaiian chief and British shipbuilder. 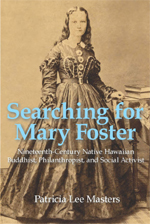 In “Searching for Mary Foster: Nineteenth-Century Native Hawaiian Buddhist, Philanthropist, and Social Activist” (2017), Masters narrates her journey of discovery about the lives of Mary Foster of Honolulu and Anagarika Dharmapala of Sri Lanka. This slim volume is as much a reflection on spirituality and shared values that connect different people and cultures, as it is a biography about a single individual. We learn a brief history of Buddhism in India; the impact of Anagarika Dharmapala on restoring the birthplace of Buddha, Bodh Gaya, to Buddhists; and Mary Foster’s influence on Buddhism in Sri Lanka and Hawaii. She had both the passion and wealth to champion the causes she believed in: Buddhism and the Native Hawaiian people. Her dual passions may seem contradictory, one looking inward for meaning and one focused outward on society, but both reflect her generosity of spirit and dedication to helping others. Mary Foster supported Anagarika Dharmapala’s quest to restore Bodh Gaya (the site of Buddha’s awakening). She also generously supported the Maha Bodhi Society, Foster Seminary for Seinhalese monks and nuns, and Foster Home (an orphanage in Colombo). In fact, a cutting from the Bodhi Tree in Sri Lanka was planted at Foster Estate in Honolulu, Hawaii. She was also critical in supporting Buddhism in Hawaii, donating land and funds to build Honpa Hongwanji Mission of Hawaii in Honolulu. In Hawaii Mary Foster is perhaps best remembered for her legacy of Foster Botanical Garden. She also founded scholarships for Native Hawaiians to attend Kamehameha Schools and bought hospital beds for the needy at Kapiolani Hospital and Kapiolani Home (later Kapiolani Hospital for Women and Children). She was a determined activist, creating petitions protesting the annexation of Hawaii in 1893 and fighting to protect native trees and water rights in Kahana Valley on Oahu. You are currently browsing the Better Hawaii weblog archives for October 2018.